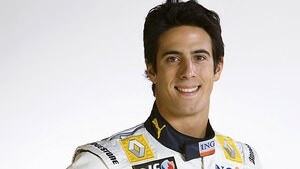 Lucas di Grassi has previously driven for the Virgin Racing team, and been a test driver for Renault. For the 2011 and 2012 season, he was contracted to Pirelli to help test with them and develop the Formula One tyres, and has been very busy with other forms of motorsport since leaving Formula One. Di Grassi has been linked to Renault (as test driver) and Honda (for a one-off test), but made his F1 debut with the Virgin Racing team in 2010. He spent one full season with the team, only missing out on the Japanese Grand Prix because he crashed on his way to the grid. At the end of the year, he was replaced by Jérôme D'Ambrosio. Lucas has also worked with the F1 tyre supplier Pirelli as their official test driver in both 2011 and 2012, driving older version of F1 cars, including a Toyota and a Renault. His work focused on developing the tyre compounds to be used in the future. Since leaving Formula One, Lucas has kept himself busy participating in the World Endurance Championship, including 24 Hours of Le Mans. He was also the first driver to win an all-electric race, taking victory in the first Formula E event in 2014. He finished that first season in third place. He's also raced in the Stock Car Brasil event, and appeared at the Audi Sport TT Cup. Lucas di Grassi makes a confident pass on Prost to move into the top ten.